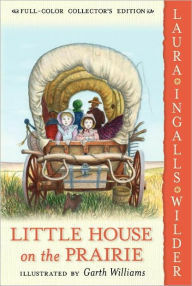 The area around the Ingalls’ little house in the big woods is getting crowded, and Pa decides to hop in the wagon and head off to “Indian country” in Kansas. The family finds a nice place to settle and spends months building a home there. But just as things are beginning to settle down to a normal life, they begin to have troubles with the natives in the area, who are angry about all the settlers moving into their territory. This plot was a lot less passive than the story from Little House in the Big Woods, and as a result I enjoyed it a good deal more. This is my first time reading the series and it’s exciting to experience the story that so many people rave about. Maybe I’ll even check out the TV series, though I hear it’s nothing like the books. One thing I had trouble with in this story was the handling of the Native Americans and their culture. Obviously, this book was written in a time when there was a lot of tension between Natives and white settlers, and the language and attitude expressed in Little House was acceptable. However, this may be one of those books that I would discuss with a young child if they were reading it. I don’t believe in telling a child not to read a book, but I do believe in discussing certain points of books with children if it’s possible for them to misunderstand the context. This is definitely one of those books. In the long run, though, I’m really enjoying this series and am eager to move on to the next book. These are such famous books. They seem to have had a big influence on our culture. I never watched the television series but when I was a child seemed enormously popular. Attitudes on race race and ethnicity in these older books are often very problematic. I agree with discussing these aspects with children before reading. I loved watching the show, but haven't read any of the books. Your comments about these books makes me want to revisit them! I read them in middle school at the latest and while I remember enjoying them, I don't remember them very well and couldn't assess them critically at all. Yeah, race certainly was handled different back then. I once got into an argument with someone who insisted that people back then were bigots when they said such things, but I tried to explain my point of view – that what they were saying was perfectly acceptable at the time, so they weren't really bigots. They're a pretty fast read! I wasn't reading “girlie” books when I was a girl. Not exactly sure why. Actually I always like to allow a child to read and book by him or herself first and then discuss it with him or her. It is amazing sometimes how much children will “get” what you think they won't “get” if you allow them to read and think on their own. And I would agree with you that these were “socially acceptable” thoughts at the time, though I do classify them as prejudiced and discriminatory. A “sign of the times,” perhaps. 🙂 Nice review! So glad you're enjoying them. I am, too, and am so glad you joined us in this reading adventure!